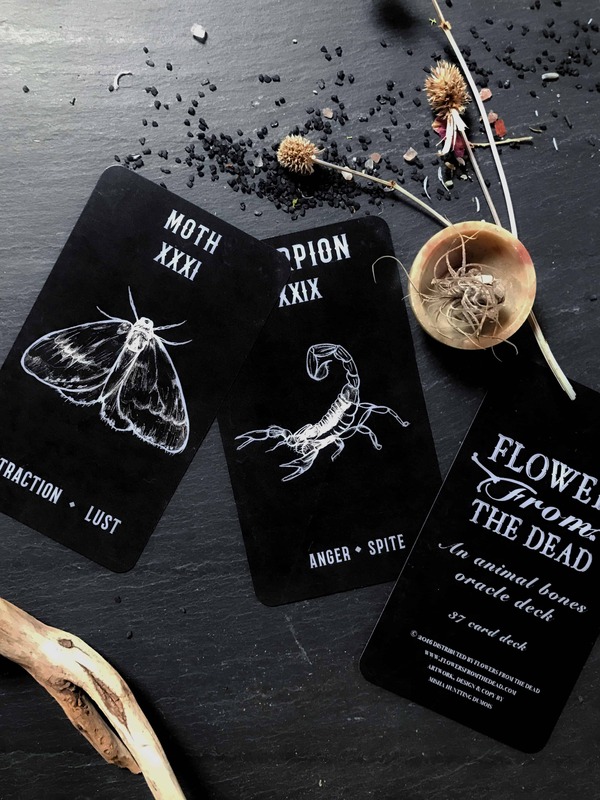 I pull cards almost everyday, but one of my favorite new oracle decks on-hand are Flowers From the Dead by American Obscura and artist Misha Huntting. Misha includes no book with these cards, as they have their meanings on them. She also has a cheat sheet for her suggested spread which I also enjoy using for a reading. Today I pulled a standard past, present, & future. I’ve been readings cards for about 22 years now and I can say these cards are great for beginners and experienced readers. One thing that is apparent is the dark color doesn’t mean void or dark energy. I’m a black-on-black New York artist type, but these have such a low hum, earthy vibe, it is very much a conceptual deck as well as a functional deck. The deck I have is the new addition with the extra 10 cards, making it a 37 card deck. Misha mentioned she will be releasing more expansion packs as time goes on so you can expand you deck as you want. This is super smart and we love the cost effective-ness of this! If you haven’t yet been able to check out her deck, I highly suggest it. We carry them in my store at Keven Craft Rituals in Eugene, OR, and I always let people do practice readings with my personal cards.